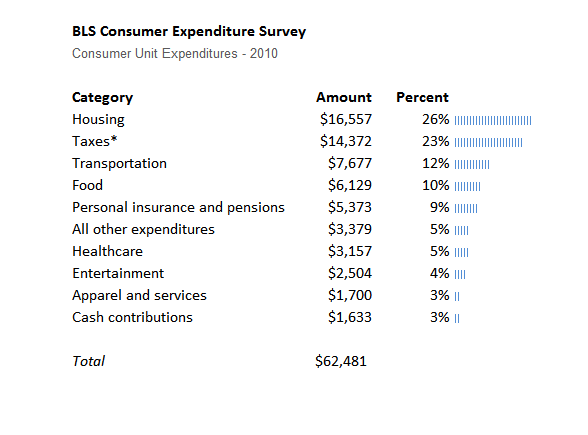 As I have previously outlined, the median Austinite’s major expenditures are housing (the mortgage or rent, not the property taxes), transportation costs (car and insurance payments) and federal taxes. And we have to think about more than costs: part of the reason for affordability concerns is the stagnation of wages. With this context, the three proposals advanced by the piece are not necessarily helpful and might actually be counter-productive depending on the implementation details. Assuming government stays the same size, a homestead exemption would shift revenue generation towards property taxes from rentals and sales taxes – both of which are likely to be regressive and place modestly higher affordability pressure on non-wealthy renters. While a capped homestead exemption would be more progressive than a flat rate one, the regressive contour relative to rental housing would remain. Similarly, while reducing the infrastructure reimbursement might hit developer profits and leave supply untouched, it is also possible that the capital behind new housing development will simply choose not to build the lower price supply. This might be successful anti-sprawl policy, but reducing housing supply will not help reduce the cost of purchasing a home or renting. Quite the opposite. Finally, as I have already discussed, the subsidy/incentive policies of the City are not significant enough to impact Austin’s affordability in any substantial way. They are just too small as a part of the budget and the jobs landscape. The allocation of subsidies certainly should be made more just and efficient – and I personally lean towards a universally available credit that facilitates the local ‘economic gardening’ approach. But regardless of the changes, this area will not yield meaningful improvements to Austin affordability. One interesting sub-plot to these three policies is that they would certainly be helpful to the affordability of existing homeowners; assuming they are all pure specimens of homo economicus, this group of Austinites has an interest in having their homes maintain high asset value but low tax and public fee costs for preserving that value. Hence a policy scheme that constrains new housing supply and shifts the burden of financing municipal government to rentals makes sense for this group. This might be a winning political coalition, but it is doubtful to prove an economically egalitarian approach. This entry was posted in Economics and tagged affordability, austin, corporate welfare, housing, median household income, taxes. Bookmark the permalink. I find this a lot. When I talk about affordability I’m talking about the people around the corner from me renting slums for $480/month. I get the feeling when a lot of politicians in Austin talk about affordability they’re talking about making tax bills more affordable for baby-boomer home owners. Which I suppose makes sense since the later votes more. The funny thing about this is that Austin homeowners are the major voting block in town and keep voting for these service increases. So this libertarian hand-wringing doesn’t really make much sense. It is also interesting that the public expenditure discussion always turns to favored growth boogeymen: housing being built far away from the core or the economic development subsidies. It never gets at the heart of the matter: the wages and benefits of teachers, cops, and firefighters. Perhaps all of this talk of affordability is just politics of emotional satisfaction without actual interest in relief. Though I certainly hope it doesn’t become just a way for existing homeowners to transfer the cost of government that they have voted for unto aspiring homeowners and lower income renters.